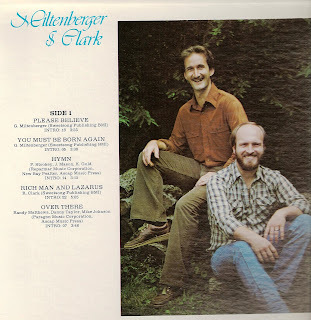 Well-produced rock and acoustic ballads custom from West Virginia duo of Gary Miltenberger and Randy Clark. Slight Southern rural edge, driven home by those female backing vocals. Gary delivers some good heavy electric guitar leads on several tracks, especially smokin’ on ‘Rich Man And Lazarus’ and ‘He’s The One’. Eight of the ten songs written by the pair, the exceptions being acoustic covers of Stookey’s ‘Hymn’ and the Matthews Taylor Johnson tune ‘Over There’ (with a nice steel guitar accompaniment). Moving string arrangements in a couple spots. Another solid ‘80s keeper with a timeless sound. (Ken Scott – The Archivist). Gary, I knew you when I lived in morgantown. You guys were the contemporary musicians at trinity episcopal. Id love to hear from you brothet!